Sounds simplistic and basic but is something often forgotten when we get caught up in day to day operations. We need to be stringent in first analysing the market as best we can, then formulating our strategy, and last executing our tactic measures. The diagnosis phase is to establish all we know about consumers, competitors and trends. It may also have the benefit of reminding you that nobody cares about your brand. The strategy phase includes goals, KPI:s, prioritised segments etc. The tactics phase is where we use the classical tools of marketing (Product, Price, Distribution and Comms). This area was touched upon by JP Hanson and Mark Ritson. JP added that we are all subject to confirmation bias and halo effects. That means we are prone to post rationalising decisions and making isolated observations into rules of thumb when it suits our purposes. He also reminded us that a lot of new trends appearing are potential tools in the tactics phase, rather than something that should affect strategy. Comms is one third of one of the three phases. CMO:s should allocate efforts accordingly (dialling back a less than healthy over- focus on this area). 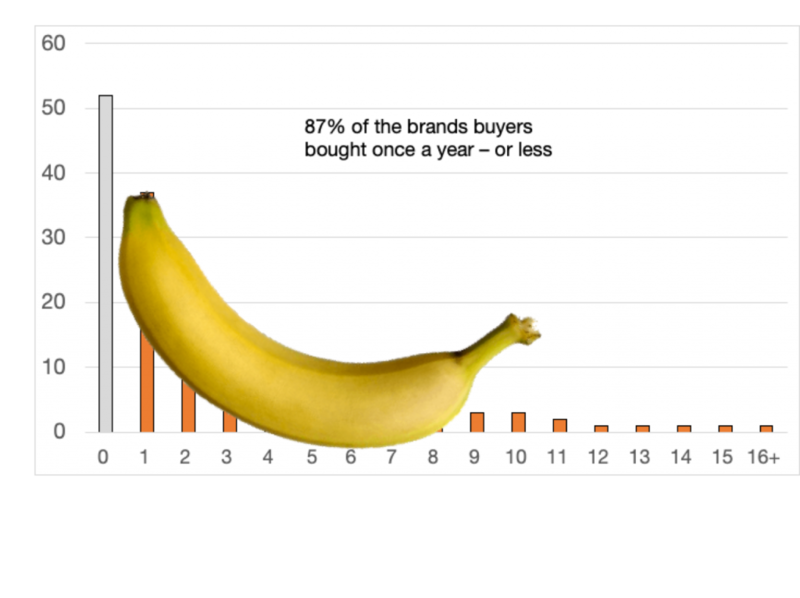 Long term emotional branding advertising and short term sales driven advertising serve different purposes, imply different strategies, and have different KPI:s.
The first point was addressed by Wiemer Snijders, who used the banana as a model to illustrate the data. The banana effect in essence mean since a lot of people by your product rarely, you must be broad in your communication. He also talked about how brands have a meaning that to some extent is only useful if it is universally known. Imagine if Rolex only communicated their values to a niche group of frequent buyers. The whole status effect of a Rolex would vanish, as no one in the general public would understand the value of what was on your wrist. Regarding the long term versus short term, there seems to be a unanimous vote in the community that the work of Binet & Field is the strategy model to follow. Even Mark Ritson grudgingly concluded that Binet & Fields work was probably the best combination of his own ideas on segmentation and Byron Sharps thinking of mental avaliability. Daring to be consistent across channels, markets and time was an important take-away. Advertising and marketing people are only human, and it is natural after working in a brand for a couple of years to get a bit bored with the brand appearance. But, as argued not least by Byron Sharp, distinctive and recognisable brand assets are key to being noticed in a cluttered communications landscape. 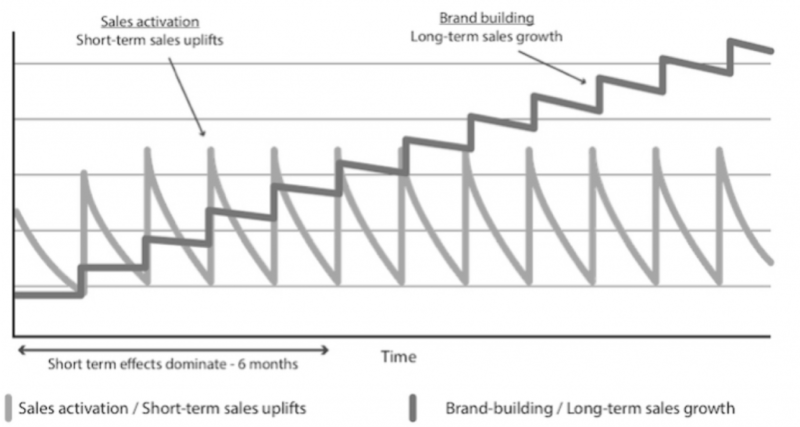 Mark Ritson added a few interesting notes from his many years as a consultant to major brands. He mentioned brand “codes”, elements that should be present in all advertising. He went so far as to instruct advertisers to refuse to pay agencies unless they included at least 2 of the brand codes. 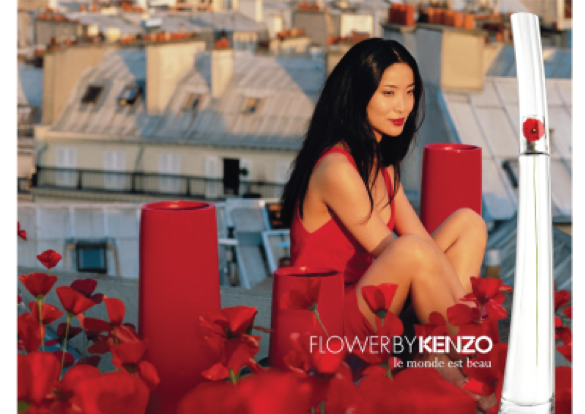 He exemplified with Kenzo, where ads always had to include red elements, the signature poppy flower, and the brands ambassador/model against a Paris backdrop. Easily recognisable as Kenzo even if the brand name is removed from the ad, right? The final piece I took away was around experimentation. As we as advertisers are dealing with the human mind, which is subject to confirmation bias, post-rationalisation and a whole host of inconsistencies, we must never let 100% of our efforts be data driven. If we do, we will be solving the problems of today, but not hedging against the future. 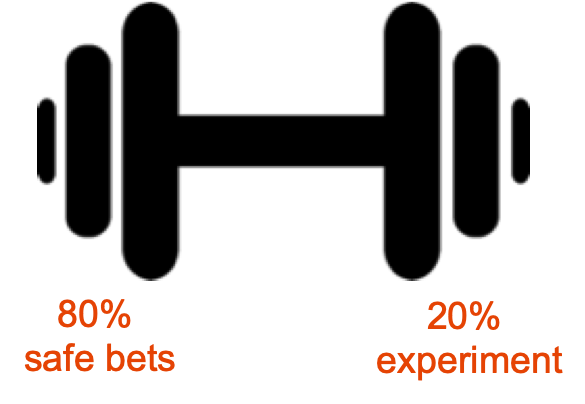 There are different models related to this, One is the 70/20/10 model (70% of marketing towards optimising bread & butter, 20% towards testing new things, and 10% totally experimental). Another model is the dumbbell model as presented by Rory Sutherland: 80% safe, 20 % crazy, and nothing in the middle. They key element to these models is not getting them mixed up. The purpose, ideation process and KPI:s should be completely different for the two different efforts. Rory also questioned why creative peoples’ ideas are always audited by structured people, but structured peoples’ ideas are never audited by creatives. All in all, the collected insights of these speakers gives a comprehensive roadmap on how to address marketing. If you are in marketing, you really should read up on these models and se how they may apply to your business. Or as Wiemer Snijders puts it: Eat your greens! P.S. Speaking were also Dr Emma Frans and Kapero consulting. As they were not on the topic of marketing theory I have left them out of this. P.P.S. Only one woman speaker?